Welcome from your innkeeper, Lynne Norris and family. 2019 is our 35th season! How the Inn came about is a story of the love of something beautiful, and the pride and enjoyment of sharing this grandeur with our guests, spanning over 30 years. 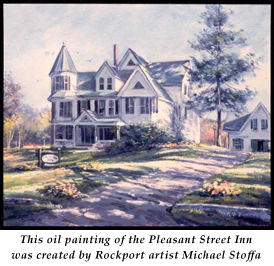 Roger and I selected this strategically sited property to begin our career as innkeepers for reasons that go well beyond the Inn's architectural stature; its welcoming ambiance, many creature comforts and picturesque setting overlooking the quintessential New England village...Rockport. Roger, the builder in my life, was immediately attracted to the Inn's structural character and architectural detail..."it has good bones, great style, and New England charm throughout". Additionally, the generously proportioned windows and the abundant natural light they hold remain a constant source of energy. With ambitious plans each May, we approach the planting of our vegetable garden with a full array of vegetables. From the generously proportioned open porch with its folk-art mural, your eye catches the graceful sloping lawn with mature trees and colorful plantings revealing scenic, distant vistas across the village. However, these are grounds made for a picnic. In addition, you'll find seating randomly placed for those quiet moments, a serious horseshoe pit beside the vegetable garden and croquet is ideal for the front lawn. Along with our seasoned staff, we look forward to your inquiries and to hosting your visit.